ProTrainings are one of the few Skills for Care centres of Excellence where we passed stringent checks to prove our commitment to high-quality training and compliance. We are also able to offer Skills for Care Endorsed qualifications for our classroom and video online training courses ensuring you have an acceptable certificate to prove your compliance. This means that our training meets the high standards expected by Skills for Care. It can be taken as an online, blended or classroom course by one of our approved instructors. The online course also acts as a good refresher course for those who just need their skills to be refreshed. This ProTrainings Qualification is also endorsed by TQUK, who are an Awarding Organisation regulated by Ofqual. This gives an extra level of appreciation on this ProTrainings qualification. You can buy an endorsed certificate if you need one, once you pass the course. You do not have to buy this extra certificate and the course is the same whichever option you choose. This course comes with 4.0 hrs (6.0 class) of CPD, although the time to complete the course online may be less than this. Total course time includes 2 hours and 19 minutes of video training as well as knowledge reviews, final test, remedial help and reviewing downloaded material. 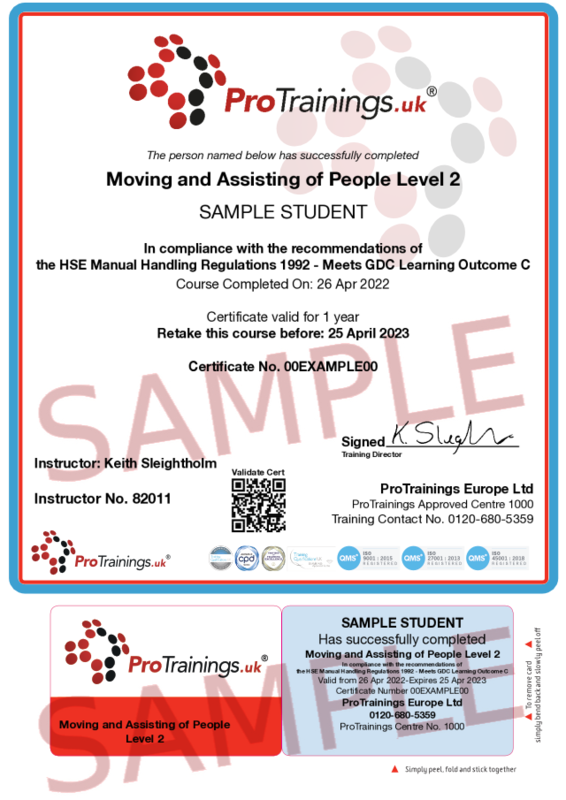 1.1 Understand the definition of Manual Handling taken from the Manual Handling Operational Regulation (MHOR) 1992, what is reasonably practicable within MPP and guidance for lifting.